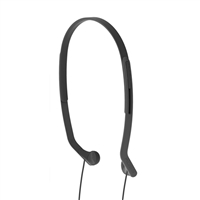 Lightweight side-firing headphones with fully adjustable comfort fit headband. Sweat resistant. Non-isolating hear through sound for ambient awareness. 4 foot cord. 100-15,000 Hz Frequency Response. Koss Limited Lifetime Warranty.